In the avian adult ovary, all three major steroid hormones are produced: oestrogens, progestagens as well as androgens. The cells responsible for steroidogenesis are located in the wall of the follicles and in the stroma in between. 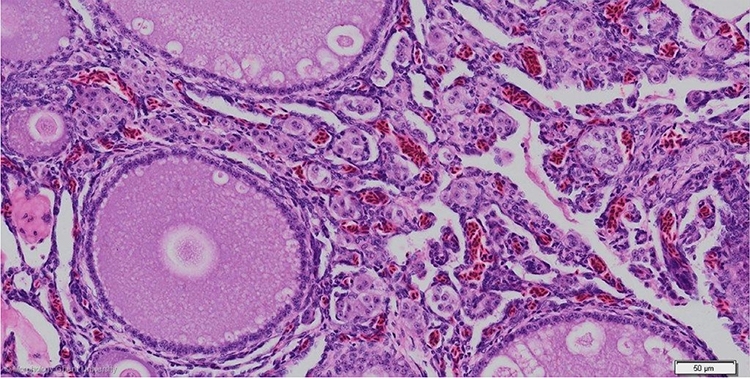 In the follicular wall, the membrana granulosa and theca externa are the layers responsible for hormone production. For a description of the overall structure of the ovary and detail of the follicles: see female tract.